The Lithuanian composer Cui was the least known member of what came to be known as "The Mighty Handful" or "Kouchka". The music and names of the others are much more familiar: Balakirev. Rimsky-Korsakov, Borodin and Mussorgsky. Apart from writing fifteen operas of all sorts and conditions Cui completed or had a hand in the completion of The Stone Guest by Dargomyzhsky and Sorochinsky Fair by Mussorgsky (superseded by Shebalin's 1930s edition). Add to these chamber music, songs and piano solos as well as various orchestral suites recorded on Marco Polo 8.220308 and 8.223400. His 25 Preludes for solo piano were recorded by Jeffrey Biegel for Naxos - originally Marco Polo. Cui's father was French - a survivor of Napoleon's invasion of Russia. His son first made his mark in the Russian military rising to the rank of Lieutenant-General. He is credited with writing a concise textbook of field fortifications (1892). By coincidence Miaskovsky was also a military engineer but from a later generation. After hearing these two discs I associate Cui with a Russian brand of flooding mellifluous bel canto. Those other fourteen operas might well be worth recording and exploring. For now though we turn to the Klanglogo disc. While it certainly bears out the romantic vocal side the disc is not without blemish. The sound is ringingly clear and Denis Ivanov is a demonstrably fine pianist. The issue is with a baritone whose voice seems frequently to be produced at the cost of considerable effort. This is evidenced under forte pressure when called on for heroism or high drama: effortful heavy weather is made. There is a tremulous struggling quality at such moments (examples at trs. 16 and 20). By contrast Bermes can and does deliver glorious lyrical engagement for some of the songs (trs. 10, 15, 21, 23). As compositions these passionately lyrical songs stand in the full-voiced Tchaikovskian tradition. A selection of them has already appeared in Russian romance anthologies including several from Chandos. They are highly attractive but I do have misgivings about this disc as a fully representative way in. Three of Cui's romantic piano solos leaven the mix. By the way, Jean Richepin (1849–1926) was a French poet, born in Algeria who also provided words for Massenet, Chabrier and Dupont. His poetry has also attracted settings by Casella, Gounod, Fauré, Bruneau, Chaminade, Vierne, Hüe, Pierné and Holbrooke. The Richepin songs can be found on IMSLP. Sadly Klanglogo do not provide the sung words or translations. The useful liner-essay is in German and English and is by Walther Prokop. The recent appearance of the Klanglogo disc reminded me that we had not surveyed Chandos' only all-Cui disc. The singing in this case is not wanting. 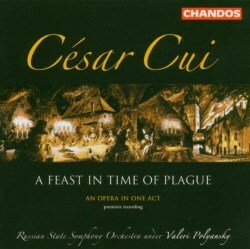 We start with one of Cui's fifteen operas: A Feast in Time of Plague. It's a "dramatic setting in one act of Alexander Pushkin's 'Little Tragedy'". This 'pocket opera', running for just over half an hour, is a lovely piece packed with heady Tchaikovskian writing. As for the plot it's a character piece which explores the personalities of those gathered around a food-laden table in plague-threatened London. It's a shame it's in one track - there were 'breathing spaces' where additional tracking would have been possible and desirable. That said it's a very touching work - meltingly lyrical, with passionate Puccinian choral interjections and glorious Rimskian harp graces in the last five minutes. The singers are all excellent and have the music well within their capabilities. Chandos offer a good playing time by adding various shorter works. Cui and Polyansky then treat us to the bustle and joyous bounce of the three very successful orchestral scherzos with Tchaikovsky seeming to serve as the model. The sound is one of silvery openness and pleases the ears. The sinister Les deux Ménétriers (Two Ghostly Fiddlers) - another Richepin poem - is sung by Tatiana Sharova. Her flammable singing complements Cui's fine feeling for drama and eerie writing. The translation reads fluently and its gothic atmosphere comes across pungently. Fair Spring is sung by Kuznetsova - all appealing and yielding femininity. She smokily darkens her voice very effectively to trace the sadness of a song bewailing the singer's loss of her menfolk - lover and brothers. Rather like Les deux Ménétriers this comes across as a sturdy operatic scena. Budrys and His Sons is a late work and one in which Cui admits some humour. The singing by Andrei Baturkin - similar to Vladimir Atlantov in his salad days - is legato smooth, warm with Italianate passion and unfailing in beautiful tone. The sound throughout this disc is good, as is the playing, and the general direction makes one regret that we hardly ever hear from Polyansky these days. The liner-note is by Philip Taylor while the sung Russian words for all four pieces are given in Cyrillic text with parallel translations into English (mostly by Philip Taylor), French and German. Two Cui discs. The Klanglogo is not without merit or ability to charm but the stronger and more generous suit here is the Chandos disc.